This week the team at PetCure Oncology celebrates National Veterinary Technician Week, paying tribute to the special efforts made by veterinary technicians on a daily basis. We cover a day in the life of a vet tech, reasons to say thank you, a personal letter from a veterinarian and share career information for those interested in becoming a veterinary technician. – Have you ever wondered what a veterinary technician does on a daily basis? 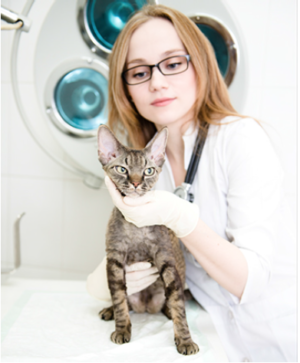 petMD’s What is a Veterinary Technician? highlights a day in the life of vet tech, helping us understand the valuable role they play in caring for our furry family members. – Veterinary technicians are the unsung heroes in pet care. This short video from vetstreet.com offers five reasons to say thank you to your local vet tech. We’re sure you’ll all agree on the number one reason to say thanks! – No one understands the value of a technician better than the veterinarians themselves. On petMD, this veterinarian wrote her own thank you letter to all the technicians that work to make animals healthier, clients happier, and veterinarians better doctors. Interested in becoming a veterinary technician? Globe University shares 5 Reasons to Become a Vet Tech, highlighting the challenges and rewards of this career choice. That wraps this week’s pet health review of news and articles for the up-to-date pet family. In closing, we’ll leave you with an invitation to learn more about PetCure Oncology and our partner sites who are brining life saving cancer care to your furry family members.